Here’s the thing. Every person who claims to be a voracious reader, a bibliophile, a bookworm occasionally hides some of their more shameful book secrets. I have some of these shameful secrets that I have been harboring for years. But, in trying to stay authentic and maybe make some of my readers feel a little less guilty about their own reading fails, I am sharing my dirtiest secrets with you. I hate Charles Dickens. There. I said it. The only book I have ever been able to finish by him is A Christmas Carol. When I tried to read Great Expectations for the tenth time, I gave up and read the graphic novel version. I read Cliff Notes in high school of some of the classics instead of reading the actual books. I have never read anything by John Steinbeck including Of Mice and Men or The Grapes of Wrath. I now prefer to read exclusively on an e-reader. Once I had kids, I realized how easy it was for them to remove bookmarks, rip pages, close the book while I was reading it, etc. I buy the print copies for appearances only. I have read every book by Nicholas Sparks. Ha! Sorry, my high-brow literary friends. I was overjoyed when my library started allowing late fee payments online because I always have late fees and I am always too ashamed to pay them in person. The first time I saw Harry Potter (long before I read the books), I fell asleep in the theater. On a date. I cannot get past the first 100 pages of The Lord of the Rings. I have tried many times, but I just cannot do it. I also cannot finish the first movie much to my husband’s horror. In 10th grade, I made a poster for a class project about Janie and the pear tree moment in Their Eyes Were Watching God…I had no idea this was a key sexual awakening scene until I read the book again in college. Once I read a book I was so ashamed to have read that I inputted a fake book into my goodreads list so no one would know. I often read quickly and skim through scenes in novels. This is why I was horrified when I saw certain scenes in Gone Girl. Apparently, I skipped right past the more graphic stuff and erased it from my mind. I have thrown books across the room when they make me angry. I’m talking to you, Time Traveler’s Wife. I go to bookstores, take pictures of books I want and then go home and get them from the library instead. I read a ton of R.L. Stine growing up. It was replaced by Christian fiction during middle school. There you have it. My shameful secrets revealed to all. What about you? Any scandalous book confessions you need to get off your chest? Share them below and let’s laugh/commiserate together. WOuld you mind if I share this on my blog too? momloves2read (dot) com? I will copy and paste then add my own "secrets" and gladly link back to your post. I do not mind at all! 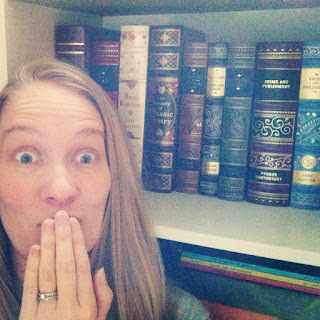 Please link back - I'd love to hear more book confessions from others! Even though I'm an active member in book club I never read. I try to but then life and kids happen. I love to read and used to read at least 4-5 books a week. I've made a commitment to read more this summer and started finally last week. I've read 5 books so far. Embarrassing that I never read but committed to continue reading more. I've loved every minute of the past week. Also, I may take books on date nights in the past in case I got bored! !